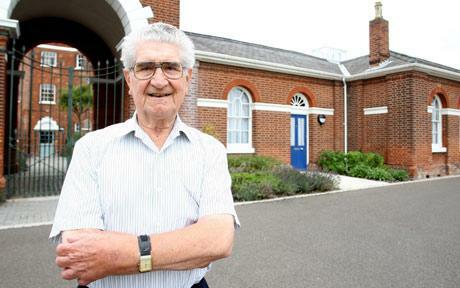 When Les Harrington, and his late wife, Doris, moved into Homebridge Village, a converted 18th Century workhouse and hospital in Witham, Essex, in 2007 they had every reason to look forward to a busy social life, surrounded by neighbours. With its own private gym, restaurant, laundry and carefully manicured gardens, the village was unsurprisingly heavily subscribed. Most of the 58 listed cottages and apartments on the 2.4 acre site, were already reserved before work had been completed. But as the housing market began to feel the financial chill and a series of deals collapsed, the owners of the site went into administration, turning the £6 million development into a virtual ghost town. Following the death of his wife shortly after moving in, Mr Harrington, an 87-year-old RAF veteran, found himself as the sole occupant. The site’s two-strong staff, a cleaner and maintenance man, were kept on while the administrators attempted to find a buyer – attentive to his every need. Mr Harrington occupied his time with his regular trips to the on-site gym and work on a novel he hopes to see published. His unusual situation made Mr Harrington an unlikely symbol of the global financial downturn, featured in newspaper articles around the world. But now, after a change in planning rules which barred anyone under 55 from moving in, he is finally welcoming his first neighbours. The change enabled Fairview New Homes, a property developer, to take over the site and sell the homes to the wider market, with two-bedroiom cottages on sale from £190,000. Mr Harrington’s first neighbours finally began moving in earlier this month, with more expected in the next few weeks. After three years of an enforced quiet life he jokes that the prospect of loud music or late night television programmes blaring out of surrounding homes could not be more welcome. “I suppose the worst time was the evenings,” he said. “I like to go outside and have a pipe of an evening and especially in the winter, it was quiet. “It will be nice now to see a light and hear people.